Did Madden Just Curse Another Victim? 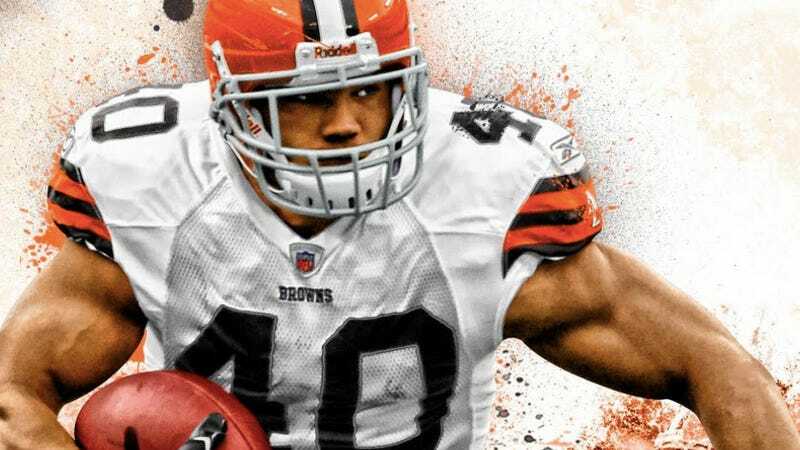 Never mind that there's no such thing as the "Madden Curse", Madden NFL 12 coverboy Peyton Hillis sat out his third-straight game this past Sunday. That's just the start of it. There Is No Such Thing As The "Madden Curse"
According to the Cleveland Plain-Dealer (via USA Today), the Browns running back could miss more games this season. And the Browns are apparently at wits' end with Hillis and are supposedly going to let him enter free agency after this season. Browns quarterback Seneca Wallace confirmed that many teammates are sick of Hillis' on-the-field and off-the-field drama, like flaky wedding plans, missing a Boys and Girls Club event, and unsuccessful contract negotiations. "It's one thing after another, and what's been out there isn't even the half of it," another source told the paper. "I think everybody's noticed a little bit of a change in him, but he could have some family issues or something," added Wallace. "Maybe his priorities have changed. We have a whole new staff, so a lot of things have changed. Maybe some of it's overblown." Said another veteran player, "I've never seen anything like it. Last year, Peyton was such a positive, inspirational force on our team—but now he's like a different guy." Because Peyton Hillis is this year's Madden coverboy! Dun dun dun.